I decided to give it go. 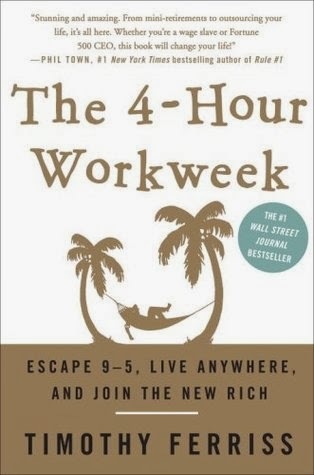 Book The 4-Hour Workweek is as controversial as Tim Ferriss is. On the other hand he has many brilliant ideas and tips, but then he does present everything as black or white. I try to be open minded to all kind of people, but it is hardest for me with people who only see things as black or white. Things are never that simple as for example Tim Ferriss presents in his book. Neither those are so complex as many believes. Tim Ferriss is really smart guy. He has achieved a lot and seems to enjoy his life. It's hard to say if he really is so happy as he says he is. In a book like his, when author states close to hundred times how good life and everything is, I start to question, if the case is really so. As an example, based on the books I've read about happiness is, that those who have absolute freedom are not really happy at all. People need to have rules and restriction in order to enjoy life. About half of the book was something I really enjoyed reading. There wasn't many new things, but some really good ideas. The rest was just total waste. I think with proper editing this version I read could have been cut to 150 pages. Now it was 350. I don't recommend this book to anyone. It has many good things in it, but the other thoughts and advice's where something I wouldn't want people to think I agree to. So the bad overrides all the good on it. I do appreciate Tim Ferriss and what he is doing, I just don't agree on many things he is saying.